Last Saturday, October 6th, 2012, I was once again invited to the Sharp Women’s Health Conference in San Diego. 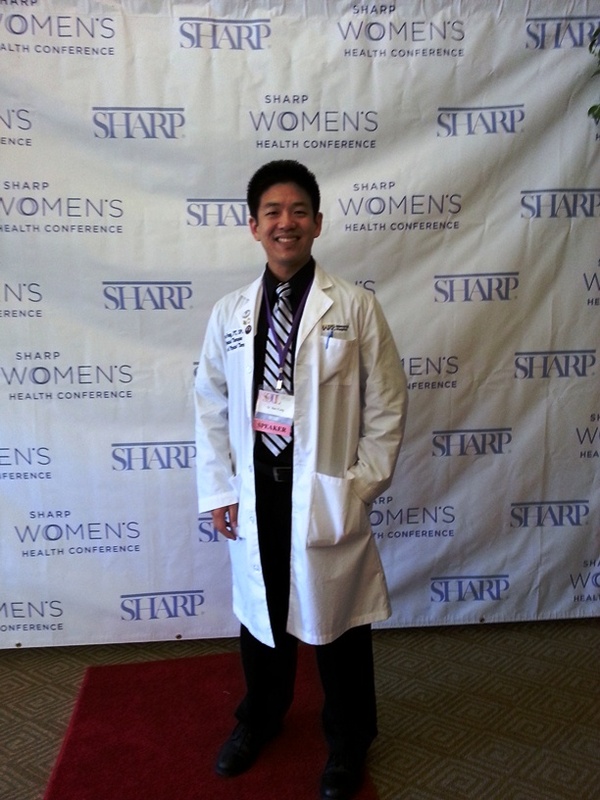 Previously recognized as the National Speaking of Women’s Health Conference, this was my third consecutive year speaking, exhibiting, and promoting health at this very highly regarded event. Over the past three years I’ve noticed a definite shift in the topics of interest for Women’s health as it pertains to physical health and fitness. Now of course the irony is that the organizers of this event keep picking a man to speak on Women’s Health-Fitness (hope I’m not bargaining myself out of a job…). Nevertheless, this post expresses some of my thoughts on the trends I’ve observed. At the Red Carpet Welcome! Three years ago, the focus for Health-Fitness was on weight loss; toning up, melting fat, improving body composition, building lean muscles – these were the catch phrases which sold like hot cakes. 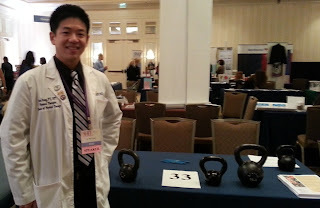 Nobody could get enough of new exercise regimens, techniques, and modalities so long as it had some relation to the topics above. However, this year, I noticed much of the focus shifted to longevity of health. There was an unmistakable interest in mental, emotional, and physical health as it relates to the “day to day”, if not “minute to minute”, habits necessary to live a whole life of wellness. From the physical health-fitness standpoint, much of the interest came from women wanting strategies of health maintenance, injury/disease prevention (ie. osteoporosis), musculoskeletal pain relief/treatment/management, and safe exercise habits. Setting up in the exhibition hall. Perhaps what was most impressive this year was the exhibition hall. Over a hundred exhibitors gathered to give freebies, loot, goodies, and samples as well as sound advice from health care professionals to nearly a thousand attendees. Fitted with a fashionable lounge in the center of the hall, the aisles were booming with interest. Two Physical Therapists and an Exercise Physiologist ran a booth called the “Physical Health and Fitness Assessment”. Essentially, this booth screened for postural deviations and limitations in physical fitness/function. As women screened positive for impairments, the Exercise Physiologist would send individuals down toward us, Physical Therapists. Education was then provided on proper body mechanics, functional movement, physical activity, and management strategies in regards to musculoskeletal pain. Our booth was so popular we caused some traffic problems in our corner – a very rewarding experience. Video of the "Hot Potatoes" kettlebell exercise. 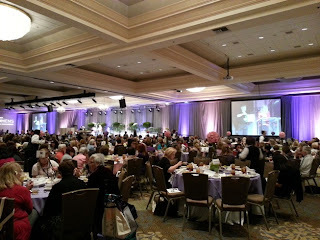 The women learning Hot Potatoes at the conference were immediately impressed by two things. First, that the exercise immediately elevates heart rate and respiratory demand. Second, how much core and arm control is required to quickly pass a cast iron ball between your palms in a controlled manner. Of all the exercises I went over, I do believe that “Hot Potatoes” was the most popular. 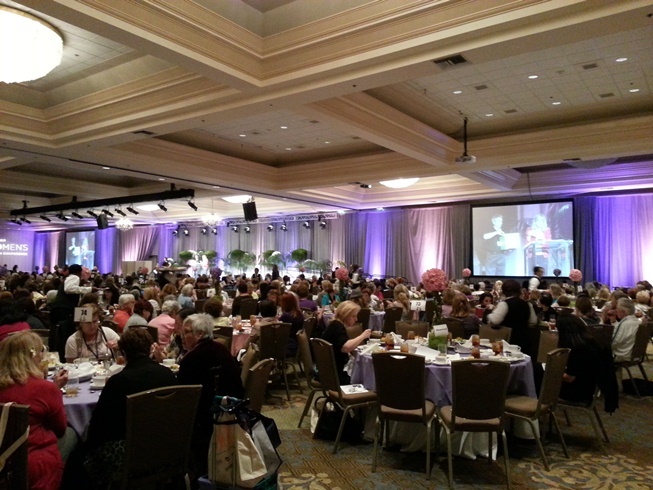 The banquet hall and the feeding of nearly 1000 attendees! Now that her breathing patterns were altered, she had a very difficult time utilizing her diaphragm, especially when trying to recover breath with exertion – hence the shortness of breath without “evidence” of cause. No amount of diagnostic tests would have yielded this discovery; only movement analysis and assessing exertional capacity does. In either case, my prescription to her was a complete lifestyle change. She has many years of retirement left and recognizes the need to become active, lose weight, eat right, and live well. For this patient, exercise is the medicine and movement is the therapy that will birth wellbeing. I think for myself, a personal take away message is how important it is to address longevity of health and not just the very popular short term goals of toning up or losing 20 pounds. I mentioned in my lecture that the path to health-fitness must be paved by a systematic, scientific method which is generously supported by genuine social investment – friends, family, clubs, and groups – to create a sense of ownership, belonging, and accountability to live well and make strong, healthy life choices. The future of healthcare must tend to a new generation at which age 79 is still young. What proof do I have? Ask the 79 year old woman in my class who started a new career as a senior fitness instructor – she swings kettlebells, she snatches, she does flutter kicks, bear crawls, duck squats, functional wall squats, windmills, Turkish get-ups… she has now taken up Suspension Training in my class. This incredible young woman has taken upon her the charge of ensuring her peers stay well, stay healthy, and live life to the fullest. THAT, my friends, can be and should be the public’s healthy future. I sincerely hope that all healthcare professionals will battle for public health that all 79 year olds will be as healthy as this one. As always, I give my sincere thanks for reading and supporting my blog & this website.